I only just got round to starting on the heap in the last day or so. I started A Visit from the Goon Squad yesterday and it looks quite promising already. Of course I’d already seen plenty of positive reviews, not to mention the Pulitzer. I’ve just been reading part of the Dan Lepard cookery book. I am absolutely inspired by his recipes – very different from your standard baking book and very much to my taste. 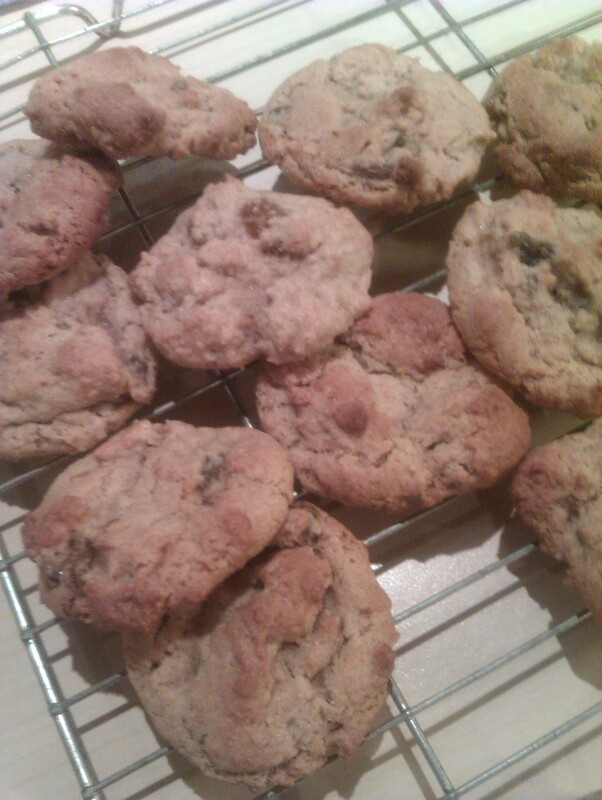 Yesterday I made his spelt and oat cookies, but substituted raisins for stem ginger. I am embarrassed to say that there are exactly two left in the tin now. I like that he explains a bit about the basic principles of baking, making it easier for you to make your own substitutions and variations. 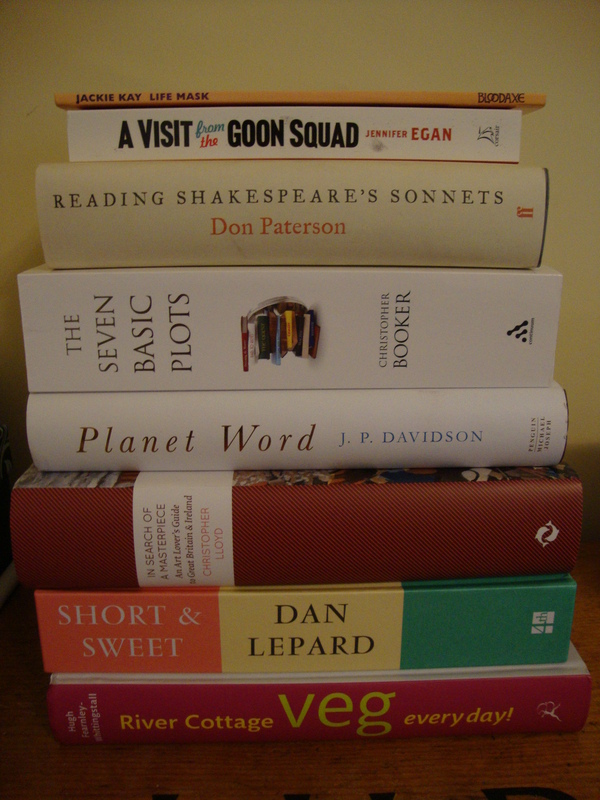 I’m certainly looking forward to starting on more of the pile, especially the substantial tomes! In the meantime, I’ve mostly been enjoying the library books that I took away with me on our Christmas visiting. I re-read Christopher Meyer’s DC Confidential – the sort of political book I really like – gossipy but well-written and I enjoy the ambassador’s viewpoint. I also re-read Identical Strangers by Paula Bernstein and Elyse Schein, the basic story of which makes you think you must be reading a rather far-fetched novel, but is actually non-fiction. Paula and Elyse are twins who were separated when they were a few months old, which they believe was deliberately for them to be studied as part of a twin study. The story of them meeting as adults is extraordinary. On the fiction side, I was rather impressed by The Hand That First Held Mine by Maggie O’Farrell. I’d never read anything of hers and I loved the way that she wound together stories from the 50s/60s and the present day – much more subtle than some authors who use similar framing. I felt that she had paced it so well that nothing seemed like a big shock reveal, but just an interesting turn. By contrast, I also read a particularly terrible Jane Austen continuation, The Independence of Miss Mary Bennet by Colleen McCullough. I could tell within the first page that it was going to be awful but for some reason I kept reading anyway. I was rewarded by a really bizarre plot about Mary Bennet being held prisoner in a cave by a murderous sect… really starting to get into so bad it’s good territory. It was rather a waste of a day. I am an absolute sucker for Pride and Prejudice sequels, but I’m pretty sure any of the other thousands of them would be better, including most of the fanfic. For a final contrast, I also finished reading 1984 yesterday! I can’t believe that I hadn’t ever actually read it, although much of it is so culturally familiar. I enjoyed Orwell’s writing style, but probably could have lived without reading the horrible last third (even though I knew more or less what was in it). Great big chunks of guilt-free novel reading have got to be one of the best points of the holiday season. Though what I really need to get on with is surely some more novel writing! This entry was posted in Books, Food and tagged books, cookies, Dan Lepard, fiction, non-fiction, reading. Bookmark the permalink.